How to Install ONE UI In Samsung Phone? 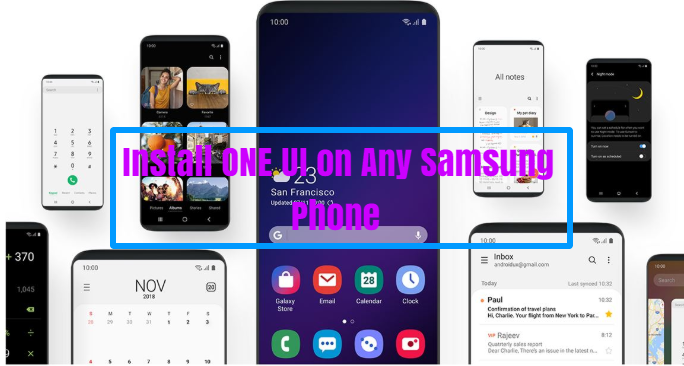 Home » Samsung » How to Install ONE UI In Samsung Phone? Welcome back with a new post that will be on How to Install ONE UI in Samsung Phone? In this post, I’ll explain how to Install ONE UI on your Samsung phone. This is not easy and I am not guarantee that this tip will be working 100%. I have shown you how to install Samsung one UI in Samsung phone running android Oreo and nougat in the easiest way for more details. Let’s begin! This tip is only for Android Oreo phone if your Samsung phone is having Android Oreo so, this tip will be working 100% don’t worry. And I also say to my Android nougat audience don’t worry, I will be back with this tip for Android nougat person and there will be showing some configuration issues. Let’s discuss and how to Install ONE UI in Samsung accepted nougat launcher. Click here to download: Here and this file name is One UI all files. After downloading you’ll need to extract that zip file on your smartphone because we will work on this file by installing an application. Now go to install all of those files which are provided in the zip file. One thing is special that name is Samsung launcher also install this one. After it all happened you need to click on the home button after clicking you’ll get 2 options I suggest you to check both are for ideas. Now go to theme and there is having a new theme which came by extracting the zip file and installing the applications files. So, there is showing two themes also that name is One UI lite and One UI Samsung. Now which you like so, click on applying simple. It will take approximately 2 minutes for applying. Note: Don’t forget to restart your device. “Install ONE UI in Samsung Phone“.